Watching graceful hula dancers is one of my favorite activities during visits to Honolulu on the island of Oahu, Hawaii. Many nights during the week you can watch a hula show for free at Kuhio Beach Hula Mound on Waikiki Beach. Located just east of the famous Duke Kahanamoku statue, you won’t miss the crowds filling in just before show time. The Hawaiian hula is a living record of the island’s history and legends of the Hawaiian people. The dancers’ movements, music and chanting combine to tell the stories of their forefathers. The show starts after the tiki torch lighting which adds to the festive atmosphere. The outdoor shows feature local hula dancers ranging from novice keiki (children) to aunties (adults). 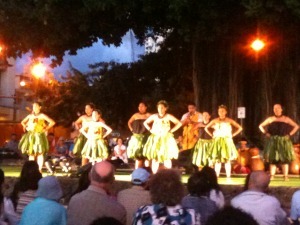 I like to go to the show multiple nights to watch different halau (dance groups) perform. Each group has its own repertoire of songs, costumes and instruments. If you are anywhere along the beach, you will know the show is about to begin when you hear the traditional blowing of the conch shell. Sometimes a torch lighter joins them as they make their way along the beach. This alerts vacationers to get their spot so as not to miss the start of the show. Bring a beach chair or pick up an inexpensive beach mat from any of the local quick marts and grab a spot near the mound. Usually a narrator will introduce the history of Hawaiian culture and language to the group. Before the dancers begin, you will learn about each song’s message and the story it tells. These dancers may wear traditional hula attire or more modern dress. To make the time-honored hula skirts, the dancers harvest and treat the long flat leaves of the green ti plant. Colorful tropical flowers are fashioned into beautiful, fragrant leis. A variety of nuts grown in the islands are strung together as necklaces. Dancers share the mound with vocalists who chant and sing the traditional stories. Musicians join in with their mix of modern and traditional instruments to make each tale come alive. The large drums made of gourds or tree trunks have a full sound which carries along the beach.